Documentaries were a new category that was added in 1941 (with the Oscar given to Churchill's Island from the Canadian Film Board (and UA), the first of several consecutive WWII documentaries to win in the same category). 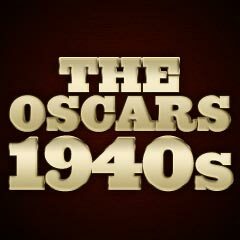 The Academy Awards ceremony for 1941 was held only a few months after the bombing of Pearl Harbor, on February 26, 1942. Soon, the Hollywood community would rally to boost morale and provide entertainment for the troops. Carole Lombard died in a tragic plane crash about a month before the Oscar ceremony, on January 16, 1942, after a War Bond rally tour appearance. Other Best Actress nominees included Barbara Stanwyck (with her second of four unsuccessful career nominations from 1937-1948 - she never won!) as burlesque nightclub dancer and gangster moll Sugarpuss O'Shea in director Howard Hawks' Ball of Fire (with four nominations and no wins), Greer Garson (with her second nomination - and the first of five consecutive nominations) as Texas orphanage founder Edna Gladney in Blossoms in the Dust, and Bette Davis (with her fifth nomination - and the fourth of five consecutive nominations) as Southern schemer Regina Giddens in The Little Foxes. Donald Crisp (with his sole career nomination) won the Best Supporting Actor award (it was the only Oscar of his long, fifty-five year career) for his role as the stern father of the closely-knit Morgan family of Welsh miners, who is killed in the mine in the film's conclusion in How Green Was My Valley. Another nominee - Sydney Greenstreet (with his sole career nomination in his 'talking' film debut at age 61), nominated for his performance as obsessed, statuette searcher "Fat Man" Casper Gutman in The Maltese Falcon, was equally deserving. 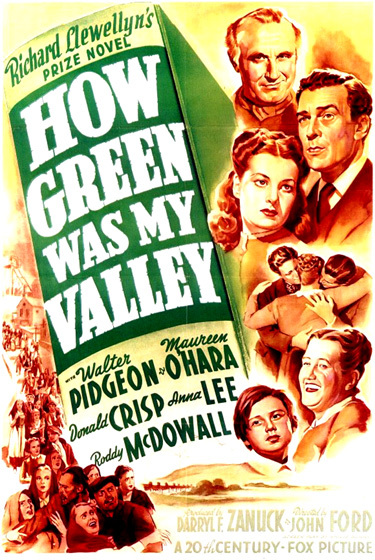 The other nominees were Walter Brennan (with his fourth and last nomination - the only nomination in his career which wasn't a winner) as village Pastor Rosier Pile in Sergeant York, Charles Coburn (with his first nomination) as the world's richest man/department store owner John P. Merrick (who masquerades as a salesclerk) in director Sam Wood's romantic comedy The Devil and Miss Jones (with two nominations and no wins), and James Gleason (with his sole career nomination) as co-star Robert Montgomery's boxer/manager Max Corkle in Here Comes Mr. Jordan. Mary Astor (with her sole career nomination) won the Best Supporting Actress award and her first and only Oscar for her performance as Sandra Kovak - a sharp-tongued, selfish and ambitious concert pianist who gives away her baby (when befriended by Bette Davis, wife of her former lover George Brent) in The Great Lie (the film's sole nomination). The defeated nominees included two co-stars from The Little Foxes: Teresa Wright (with her first nomination in her debut performance) as Alexandra Giddens (daughter of co-stars Bette Davis and Herbert Marshall), and Patricia Collinge (with her sole nomination) as Aunt Birdie Hubbard. The remaining nominees were Sara Allgood (with her sole career nomination) as the loving, supportive, and gentle mother figure Mrs. Morgan in How Green Was My Valley, and Margaret Wycherley (with her sole career nomination) as devoted Mother York in Sergeant York. Disney won another Short Subject: Cartoon Oscar for Lend a Paw - his ninth win in the category. Leopold Stokowski received a Special Award for "unique achievement in the creation of a new form of visualized music" in Walt Disney's technologically-innovative production of Fantasia - a big commercial flop at the time. The film's innovators (Walt Disney, William Garity, John N.A. Hawkins, and the RCA Manufacturing Company) also won a second Special Award for "their outstanding contribution to the advancement of the use of sound in motion pictures." Barbara Stanwyck's and Henry Fonda's performances in Sturges' The Lady Eve went unrecognized. Peter Lorre and Humphrey Bogart (as cool, yet tough-talking anti-hero detective Sam Spade) weren't nominated for their work in John Huston's film-noirish mystery The Maltese Falcon. [In fact, Peter Lorre was never nominated for an Oscar.] Bogart had another amazing non-nominated performance also this year, as Roy "Mad Dog" Earle in Raoul Walsh's classic gangster film High Sierra (with no nominations). And Mary Astor, who won for The Great Lie, is better remembered (and would have preferred to have been nominated and victorious) for the murderous femme fatale Brigid O'Shaughnessy in The Maltese Falcon. Although there was no Oscar awards category for Best Makeup until 1981, Citizen Kane was remarkable in the way that its characters aged from start to finish. And although the film had nine nominations, only one was in an acting category (Best Actor for Orson Welles). Others who had notable performances included: Joseph Cotten as Jedediah Leland, Dorothy Comingore as Susan Alexander, Everett Sloane as Mr. Bernstein, and George Coulouris as Walter Parks Thatcher. Another unforgivable omission was denying the award of Best B/W Cinematography to nominee Gregg Toland for the film's marvelous photography. Howard Hawks' Ball of Fire and Alexander Korda's That Hamilton Woman were not included in the group of Best Picture nominees. Vivien Leigh's performance in That Hamilton Woman was also unnominated. Although Gary Cooper won Best Actor for Sergeant York, he had two other equally important hits in 1941 without nominations: Ball of Fire, and Meet John Doe. Bernard Herrmann who wrote some of the most dramatic film scores in the history of cinema (Welles' Citizen Kane, The Magnificent Ambersons (1942), Hitchcock's Rear Window (1954), Vertigo (1958), North By Northwest (1959) and Psycho (1960), and Scorsese's Taxi Driver (1976)) won his only Oscar in 1941 for Best Scoring of a Dramatic Picture - All That Money Can Buy.